The Ladies' choir consists of about 40 singers. 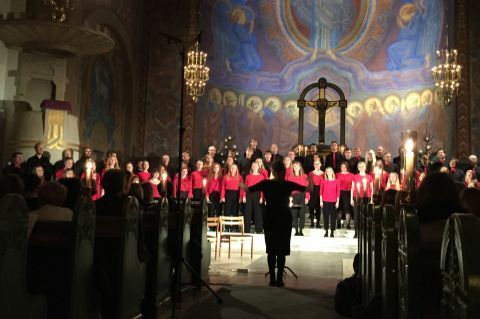 The choir has been in existence since 1988 and is thus the youngest of the three choirs. The conductor of the Ladies' choir is Kristina Nelson and she can be seen every Monday evening rehearsing with the ladies' choir. Kristina is educated as a cantor and choir conductor at the folk high school Oskarsharshamn and the Academy of Music and Drama in Gothenburg. Since she received her cantor's degree in 2004 she has led several different choirs: children and youth choirs, vocal ensembles, gospel choirs and different adult choirs. Kristina enjoys arranging music for the choirs she leads. Today, she works as a church musician in Sävedalen and has been conducting Chalmers Ladies' Choir since november 2016. In her spare time she sings in the choir "Göteborg a Capella". She also enjoys outdoor activities, exercising and travelling.